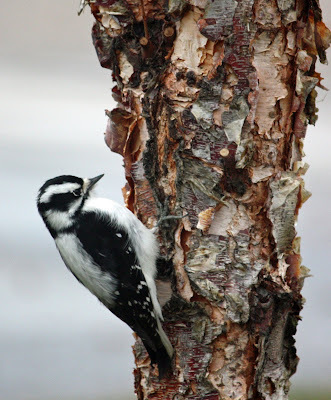 A sweet little girl downy woodpecker looking for treats in the papery bark of a river birch tree. This is a very small woodpecker, just a little bigger than all the finches that winter around here. How beautiful! I didn't know woodpeckers could be as small as finches. Aw, sweet girl, stay warm!